This project demonstrates a basic idea of the Internet of Things (IoT), whose applications are extending from smart homes to wearables. This project demonstrates a basic idea of the Internet of Things (IoT) whose applications are extending from smart homes to wearables to healthcare. "The Internet of Things has the potential to change the world just as the Internet did. Maybe even more so" - Kevin Ashton. Here in this project, I am demonstrating a method to switch on/off and blink an LED from a website which can be accessed worldwide. This project can be developed further making it useful in our day-to-day lives. Instead of the LED used here, if we connect the PI to AC mains via a relay, it becomes a Home Automation. The Raspberry Pi should be provided with an SD card loaded with an appropriate OS (preferably Raspbian) and should be connected to a monitor via HDMI to VGA converter or to a laptop via SSH. Apart from the above components, a router with internet connection should also be present with the Raspberry pi being connected to it. The connections in this project are very simple. Connect the positive pin of LED to GPIO 17 pin and the negative to a 270 ohm resistor, the other side of which is connected to GND pin. 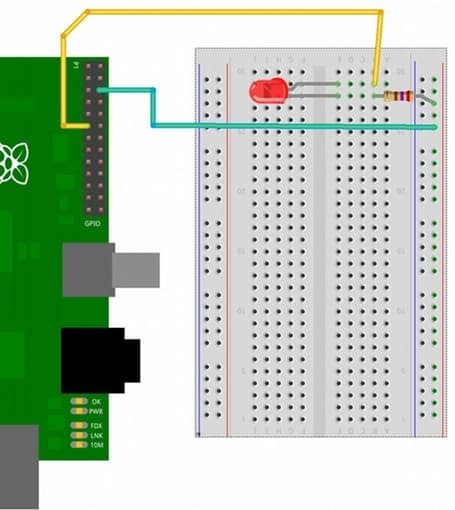 WiringPi is basically a GPIO interface library for Raspberry Pi. There are 2 methods to install the WiringPi library. (All the commands given below are to be executed on the Pi's terminal). Try out this method only if method 1 doesn't work out. Click the above URL and check for the link marked snapshot at the right hand side. Click the top one which will download a tar.gz file like wiringPi-xxxxxxx.tar.gz (xxxxxxx represents a combination of letters and numbers which is unique for each download). Thus the WiringPi library will be installed by one of the above methods. For more details about WiringPi library, please visit http://wiringpi.com/. To make sure Wiring Pi is installed and works properly, run the gpio -v command; it should return the current version of Wiring Pi along with the basic Raspberry Pi info. Apache is a popular web server application you can install on the Raspberry Pi to allow it to serve web pages. On its own, Apache can serve HTML files over HTTP, and with additional modules can serve dynamic web pages using scripting languages such as PHP. In our project we are using an HTTP server and its PHP extension. MySQL database is not used here. In order to test if the Apache server is working properly, navigate to the browser and type your Pi's IP address. To get Raspberry Pi's IP address, type ifconfig on the terminal. Next to the wlan0 entry, you will see inet addr: 192.168.x.x which is the IP address of the Raspberry Pi. You should see an It works! page. Save it and refresh the page in your browser. A long page with lots of information about PHP will appear. Thus, the PHP extension is installed properly. If any of the pages do not appear try reinstalling the apache server and its PHP extension. Here in this project, we will be coding in PHP to control the GPIO pins, which is embedded in an HTML page. GPIO pins of the Raspberry Pi can be controlled by PHP using shell_exec() function. This function executes command via shell and returns the complete output as a string. Check for the values returned by the button and accordingly make the GPIO pin HIGH/LOW using if/else-if statements. The entire code can be downloaded from the link below. After completing the code, the next step is to run the code on your browser. Type the IP address of the Raspberry Pi on the browser. You will see 3 buttons - ON, OFF and BLINK as shown in the image and you will be able to control your LED by clicking those buttons. This control can be obtained from only those devices connected to your router (local network). The LED cannot be controlled from any other network. In order to do that, follow the instructions in the next step. Now we are able to control the LED by the local host network. In order to make it accessible world-wide, we need to change few settings in the router and also obtain a free domain name. First obtain the unique public IP address of your router from https://www.whatismyip.com/. The next step is to log in to the router by typing this address. Take the port forwarding option and add a new port (not 80 since it is the default port) by providing the IP address of the Raspberry Pi and enable it. Now if you type your public IP address and the port number separated by a colon in the format: <Public ip address>:<Port number> in the browser of any network, you will be able to access the page. Since this IP address is too long and hard to remember, you can get a free domain name from http://www.noip.com/ where you have to configure the device by setting up the right port. This will enable you to control the LED from anywhere in the world.